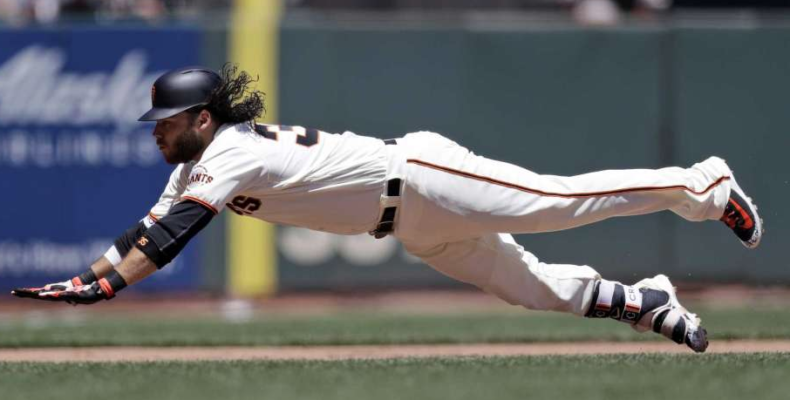 Brandon Crawford is an excellent baseball player who makes excellent plays and hits excellent. Yesterday, under the sun and blue skies at Willie Mays Field he demonstrated his excellence with huge hits, driving in three runs and missing a two-run homer by inches. He helped turn four double plays that bailed out Andrew Suarez, who, despite pitching in traffic most of his 5.2 innings, allowed only one run on 8 hits. BCraw’s heroics were only part of the story. There was an uncharacteristic error by the shortstop and some dramatica personae in the ninth. The Giants bullpen pitched well enough to lose but since .500 was in the balance and the Giants love .500, the San Franciscans were able to hold on after the hitters added on. The leakiness of the pen and some defensive mishaps nearly let the Padres back in the game but the ending was instead a happy one. Andrew McCutchen was hit by a fastball by some friar after getting brushed back a pitch earlier. Fisticuffs may in the air. Cutch was not happy. Mac Williamson was sent down to fix his swing. Austin Slater took his place and promptly hit a sacrifice fly. This was an interesting game, a pitcher’s duel until the Giants magical sixth and Crawford’s two-run double. Gorkys had another good game in center and at the plate, and hammering an RBI double. We found our center fielder.